Download "Qualifications. Key Result Areas"
3 Family Engagement Social Worker Reports to: Academy Director Receives Direct Reports From Provides Work Direction To Family Engagement Social Worker The principle tasks of the Family Engagement School (FES) Social Worker are to: help students and families make the best use of available opportunities and resources; and fully develop each student's individual potential. 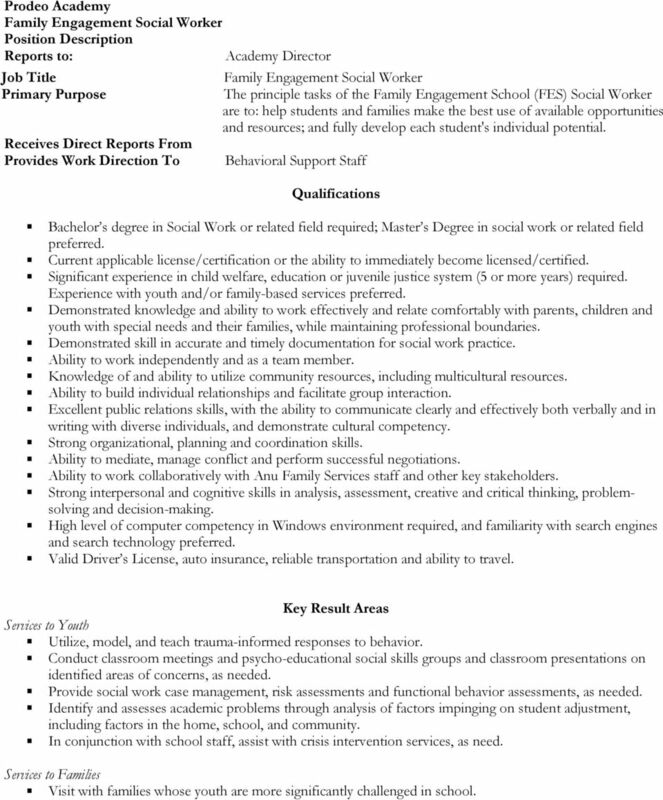 Behavioral Support Staff Bachelor s degree in Social Work or related field required; Master s Degree in social work or related field preferred. Significant experience in child welfare, education or juvenile justice system (5 or more years) required. Experience with youth and/or family-based services preferred. Demonstrated knowledge and ability to work effectively and relate comfortably with parents, children and youth with special needs and their families, while maintaining professional boundaries. Demonstrated skill in accurate and timely documentation for social work practice. Knowledge of and ability to utilize community resources, including multicultural resources. Ability to build individual relationships and facilitate group interaction. Excellent public relations skills, with the ability to communicate clearly and effectively both verbally and in writing with diverse individuals, and demonstrate cultural competency. Ability to work collaboratively with Anu Family Services staff and other key stakeholders. Strong interpersonal and cognitive skills in analysis, assessment, creative and critical thinking, problemsolving and decision-making. High level of computer competency in Windows environment required, and familiarity with search engines and search Valid Driver s License, auto insurance, reliable transportation and ability to travel. Services to Youth Utilize, model, and teach trauma-informed responses to behavior. Conduct classroom meetings and psycho-educational social skills groups and classroom presentations on identified areas of concerns, as needed. Provide social work case management, risk assessments and functional behavior assessments, as needed. Identify and assesses academic problems through analysis of factors impinging on student adjustment, including factors in the home, school, and community. In conjunction with school staff, assist with crisis intervention services, as need. Services to Families Visit with families whose youth are more significantly challenged in school. 4 Use parent coaching interventions to assist families in managing challenging behaviors and decreasing trauma responses. 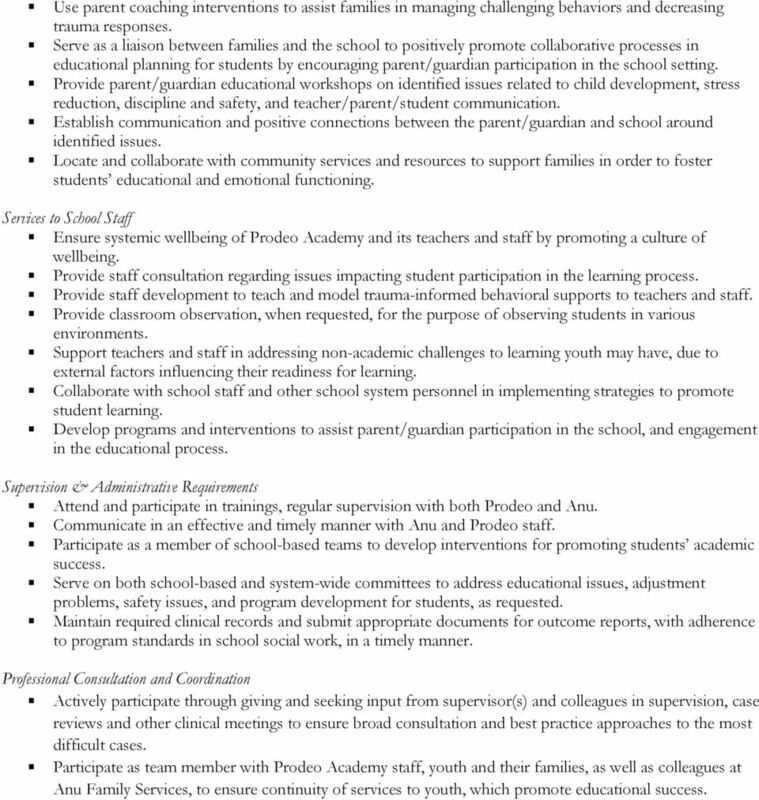 Serve as a liaison between families and the school to positively promote collaborative processes in educational planning for students by encouraging parent/guardian participation in the school setting. Provide parent/guardian educational workshops on identified issues related to child development, stress reduction, discipline and safety, and teacher/parent/student communication. Establish communication and positive connections between the parent/guardian and school around identified issues. Locate and collaborate with community services and resources to support families in order to foster students educational and emotional functioning. Services to School Staff Ensure systemic wellbeing of Prodeo Academy and its teachers and staff by promoting a culture of wellbeing. Provide staff consultation regarding issues impacting student participation in the learning process. Provide staff development to teach and model trauma-informed behavioral supports to teachers and staff. Provide classroom observation, when requested, for the purpose of observing students in various environments. Support teachers and staff in addressing non-academic challenges to learning youth may have, due to external factors influencing their readiness for learning. Collaborate with school staff and other school system personnel in implementing strategies to promote student learning. Develop programs and interventions to assist parent/guardian participation in the school, and engagement in the educational process. Supervision & Administrative Requirements Attend and participate in trainings, regular supervision with both Prodeo and Anu. Communicate in an effective and timely manner with Anu and Prodeo staff. Participate as a member of school-based teams to develop interventions for promoting students academic success. Serve on both school-based and system-wide committees to address educational issues, adjustment problems, safety issues, and program development for students, as requested. Maintain required clinical records and submit appropriate documents for outcome reports, with adherence to program standards in school social work, in a timely manner. Professional Consultation and Coordination Actively participate through giving and seeking input from supervisor(s) and colleagues in supervision, case reviews and other clinical meetings to ensure broad consultation and best practice approaches to the most difficult cases. Participate as team member with Prodeo Academy staff, youth and their families, as well as colleagues at Anu Family Services, to ensure continuity of services to youth, which promote educational success. 5 Special Education Teacher Special Education Teacher The Special Education Teacher ensures that all special education students produce breakthrough academic results. 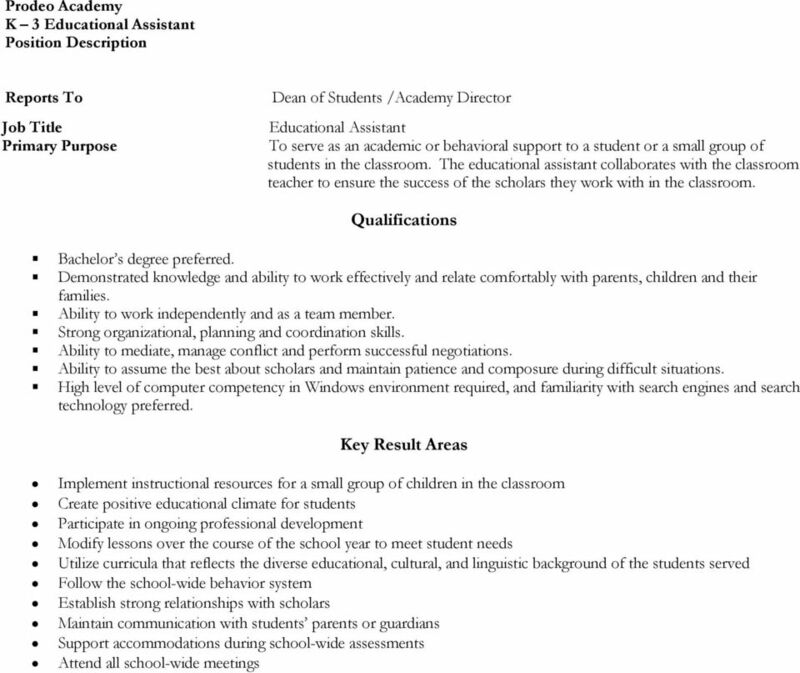 The Special Education Teacher holds primary responsibility for the development, implementation, and assessment academic intervention at Prodeo Academy. The Special Education Teacher ensures that the IEP needs of all special education students are met with robust and rigorous strategies. 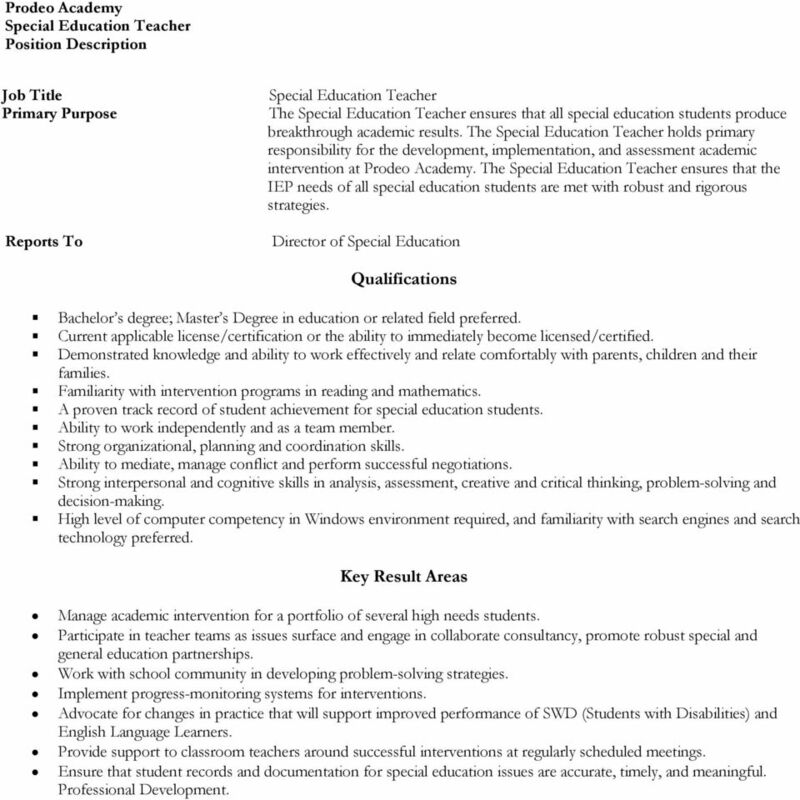 Director of Special Education Bachelor s degree; Master s Degree in education or related field preferred. Familiarity with intervention programs in reading and mathematics. A proven track record of student achievement for special education students. Strong interpersonal and cognitive skills in analysis, assessment, creative and critical thinking, problem-solving and decision-making. 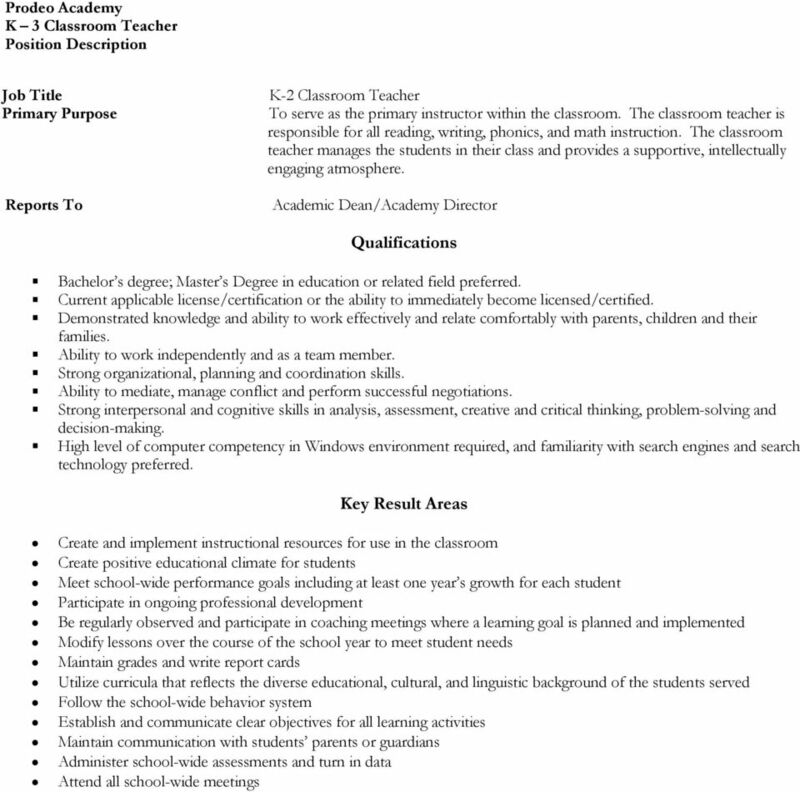 Manage academic intervention for a portfolio of several high needs students. Participate in teacher teams as issues surface and engage in collaborate consultancy, promote robust special and general education partnerships. Work with school community in developing problem-solving strategies. Implement progress-monitoring systems for interventions. Advocate for changes in practice that will support improved performance of SWD (Students with Disabilities) and English Language Learners. Provide support to classroom teachers around successful interventions at regularly scheduled meetings. Ensure that student records and documentation for special education issues are accurate, timely, and meaningful. Professional Development. There are 4,400 students enrolled in Salem Public Schools. Bentley Elementary, is currently a Level 4 school undergoing a turnaround redesign. Recommendations. Support facility renovations identified as needed for improving emergency preparedness.